It’s a big month for Snapchat, whose parent company, Snap Inc. went public last week. On Wednesday, March 1st, Snap Inc. priced its first batch of shares at $17, and since then, they have gone up to $27, making it the biggest U.S. tech listing in more than two years. Snapchat, an estimated $20+billion enterprise, is taking all the attention away from Instagram, who recently released “Instagram galleries,” a feature that lets users upload up to 10 images and videos in a single Instagram post. 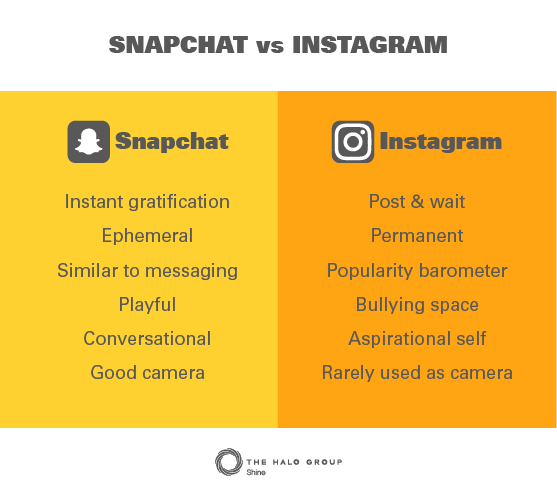 Snapchat and Instagram are both giants in the photo and video space. So what sets them apart? And which is winning the social media game? Nonetheless, both of these companies are in it for the long haul, and social media is a roller coaster full of many ups and downs; Instagram won’t go out without a fight and they have the backup of industry giant Facebook. Time will tell who will be the “winner”.